According to recent job outlook data, registered nursing ranks as one of the top 10 occupations for annual job growth in the Buckeye State. By 2025, state projections place the number of qualified nurses well above anticipated demand. The profession is set to become fiercely competitive in the coming years, making it important for aspiring nurses in Ohio to understand industry and licensing requirements as well as select a top nursing school for education and training. This guide provides information on obtaining the education needed to practice in the state as well as necessary steps for licensure. 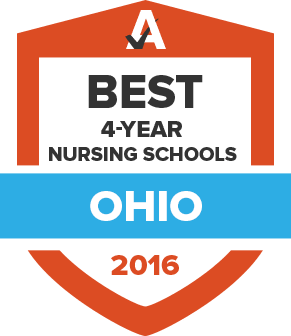 The Ohio Board of Nursing regulates all educational programs and regularly reviews these offerings to ensure each meets requirements for both coursework and clinical experience. A number of approved nursing schools exist in Ohio at the undergraduate and graduate levels. The tool below can help future students begin their search for a nursing school that matches their needs. In addition to education and training through a state-approved nursing program, new nurses must meet certain requirements to be issued an Ohio RN license. As a member of the 25-state Nurse Licensure Compact, Ohio allows nurses from other member states to practice if they have a multistate license and fulfill additional requirements. First-time applicants will find a list of mandates below, along with details about the renewal process. Applicants whose home is in a Nurse Licensure Compact (NLC) state other than Ohio must apply for a multistate license. Applicants whose home state is not part of the NLC must apply for single-state licensure in Ohio. Registered nurses in Ohio must renew their licenses by October 31 of every odd-numbered year. Nurses are required to complete 24 hours of approved continuing education credits during each cycle. This requirement consists of one hour on Ohio Law & Rules, while the remaining 23 hours are dedicated to the nursing practice. If the license has been inactive of lapsed for at least two years, the applicant is still required to complete 24 hours, but that time is spread across Ohio Law & Rules, the nursing process and critical thinking, pharmacology, ethical principles, and nursing practice. While these hours don’t have to be submitted to the board, all nurses are advised to keep proof of completion incase they are audited. Registered nurses pay a $65 renewal fee. For more information about advanced practice nursing in Ohio, please visit the Ohio Board of Nursing. Healthcare employers in Ohio are constantly searching for qualified registered nurses. It’s a competitive field and the Bureau of Labor Statistics’ projections indicate the number of jobs for nurses in the state will continue to grow. This keeps annual wages below the national average, but still in line with the state’s cost of living. Take a look at the annual mean wage for different metropolitan areas below. The Ohio Action Coalition is a professional group led by the Ohio League for Nursing and the Ohio Hospital Association that aims to meet health care challenges in the state. The Ohio Association of Advanced Practice Nurses provides nurses with access to continuing education, networking opportunities and legislative updates. The Ohio League for Nursing is the state affiliate of the National League for Nursing that promotes professional growth and development in the nursing profession. The league also offers continuing education opportunities and other varied resources. The Ohio Nurses Association is a member group representing the interests of more than 160,000 registered nurses in the state. The organization, which is based in Columbus, is affiliated nationally with American Nurses Association and has 13 nursing districts throughout Ohio. The State of Ohio Board of Nursing is the official licensing body for registered nurses, licensed practical nurses and other nursing professionals in Ohio. State of Ohio Nursing is part of the Ohio state government’s Hiring Management System. It offers resources for nursing professionals interested in working in the state health care system.